I presented the following information at a workshop hosted by the Palouse Writers Guild on Saturday, July 28, 2018. The second part of the presentation will appear in a separate blog post. Author Platform Definition: The ability to sell written content (books, short stories, magazine articles, etc) because of who you are or who you can reach. Simply put, a platform is your visibility as an author in the communities in which you participate. An author’s platform grows out of their body of work. It’s next to impossible to build a platform for work that doesn’t exist. Platform building is a consistent ongoing effort that a writer will engage in over the course of their career, which may include: previous books or other written work, personal and professional connections, media outlets and appearances, an online presence, and readership. A platform is NOT marketing and promotion. Repeatedly posting “Look at me!” on social media is not platform building and, unless you have 100,000 followers, is of little interest to a publisher. The whole point of a platform is to market yourself to a publisher. Do you need a platform to get published? If you’re a nonfiction writer, yes. If you’re a fiction writer, no. Fiction writers should focus on crafting the best work possible. Platforms are welcome if the author has one, but agents and publishers ultimately make decisions based on the quality of the manuscript. Many industry professionals recommend starting your platform three years before the publication of an author’s first book. The purpose of an author platform is not to sell books; it’s about career building and allows authors to introduce themselves to the industry. Publication in newspapers, magazines, literary journals, and anthologies can often be sufficient to build a platform and land a book deal. These types of prior publications help agents and publishers understand how your book fits into the world and who your readers are. Jane Friedman encourages novice fiction writers to forgo the idea of developing an author platform, in favor of focusing exclusively on their writing. It is premature for those who are struggling to find the time to write to fill up their days tweeting and blogging. Buying a platform doesn’t take much time, but it does take money. Most authors don’t make much money so buying a platform is generally out of the question. Not only does hiring ghostwriters, paying for professional website development, and contracting with social media management companies expensive, but soaking money into these items won’t guarantee readership. Of course, authors can buy lists of “followers,” too, but buying followers or email addresses isn’t going to generate a meaningful audience who cares about their work enough to buy the book. Building a platform takes time, but doesn’t require much money. Publishing quality work in outlets your target audience reads is the best way to build a platform. To that, many authors add: blogs, e-mail newsletters, social media, podcasts, speaking engagements, and networking. This enables you to gathers quality followers and develop a community of people who are interested in your work. Borrowing a platform takes neither time nor money. The key here is to connect with O.P.P. (Other People’s People). To do this authors connect with other authors who have already gathered followers matching the demographics of your target audience. Offering to do a reading, interview, or guest post are great ways to reach the right people. Ability to Execute 15% — Ability to execute is whether or not the author follows through, meets deadlines, and how well they work with other writers, editors, agents, and publishers. Personality 10% — Personality relates to whether or not an author has figured out and established their persona as an author. Donald Rumsfeld once said, “You go to war with the army you have, not the army you might want.” That’s exactly the attitude cultivate when building an author platform. Start with what you’ve got and slowly build your platform from there. 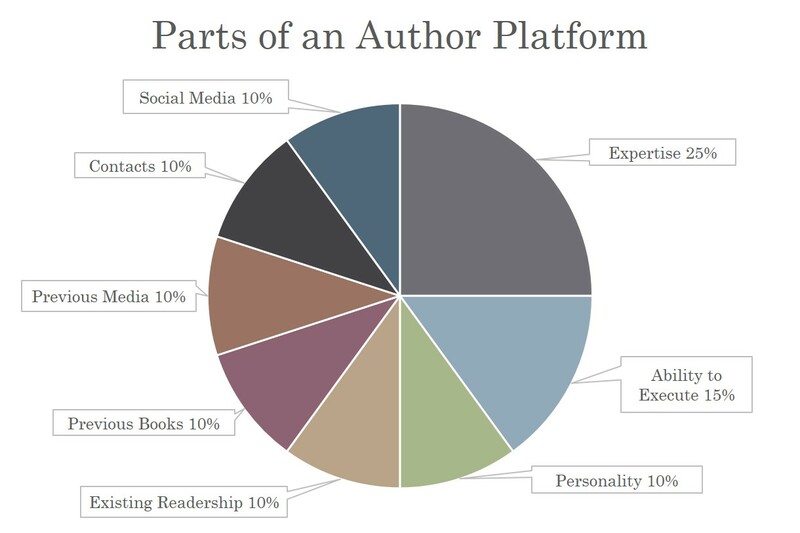 Many of the tools authors use to build their platform are outlined below. Writing columns or articles for newspapers or magazines. Writing for online journals or magazines. Becoming a guest contributor for a blog. Writing Short Fiction and /or Flash Fiction for anthologies. Self-publishing on Amazon, Lulu, or other sites. With any kind of product release, including a book, who you know matters. The more people you know, the easier platform building will be, especially if those people are in high places. Many organizations promote the successes of their members while ignoring non-members. That means building a professional network is vital to platform building. Members of your network can add credibility to you as an author through blurbs, book reviews, or recommendations to their own readers. Belong to clubs and professional associations. Be a friend to all bookstores and libraries. Tie your book into a charity. Host an event. Whether it’s a book launch party, giveaway, or contest, authors should create buzz, pull people in, and interact with their audience. Pitch yourself to local media. Offer to be interviewed, provide quotes, or contribute an excerpt from your work, but most of all, be available, dependable, and helpful. Accept any and all offers to be interviewed for a blog, podcast, TV or radio show. Accept speaking engagements. Picking up a gig at local schools, universities, writing groups, or conventions is a fantastic way for an author to spread the word about their work. Make a video. Create a book trailer or 5 minute behind-the-scenes video and upload it to YouTube. People rarely buy books, courses, or coaching from social media, but email lists generate billions of dollars in sales annually. And, unlike social media, email enables authors to reach their target audience day after day, without having to worry about shifting algorithms. Facebook, Twitter, and Instagram can change the way they do business overnight, but an author always has full control over their email list. Develop your list. Send a note asking contacts to sign up for notifications. This is called permission marketing and is much more effective than interrupt marketing. Entice them to opt-in using a lead magnet, such as PDF checklists, training videos, or even your first chapter. Put the signature line to work. All authors should include the URL for their website and any social media sites where they’re active. Write a newsletter. This keeps readers updated on an author’s progress and publications on a weekly, bi-weekly, monthly, or quarterly basis. Ideas for newsletters include: tips and advice for clients and potential clients, short articles related to your area of expertise, or updates about works in progress. The danger with social media is that many authors use it ineffectively, and then they wonder why their social networks aren’t driving sales. Part of that comes from choosing a social network that isn’t well matched to their writing. The other reason is, social media is a really poor place to try selling anything. However, it’s a good place build brand loyalty. It is impossible to be everywhere, so pick two social media networks. A recent study said 79% of adults had a Facebook account compared to only 23% with Twitter accounts. The percentage of users on other sites declines rapidly after that. * But, if you already have Instagram, Pinterest, Google+, Goodreads, Wattpad, etc. there is no reason not to include the occasional post on those accounts, too. Tweet micro-fiction on Twitter or post flash fiction on Facebook. Use LinkedIn to make professional connections. Share book recommendations, genre-related news, and other interesting links followers might care about. *I heard on NPR this week that Instagram just surpassed Twitter for the second most used social media network. Author Platform: What Are You Waiting For?